Saint Joseph Regional is thrilled to welcome Dr. Alec Gallimore '82 back to campus this June as the keynote speaker for the school's 54th commencement exercises. 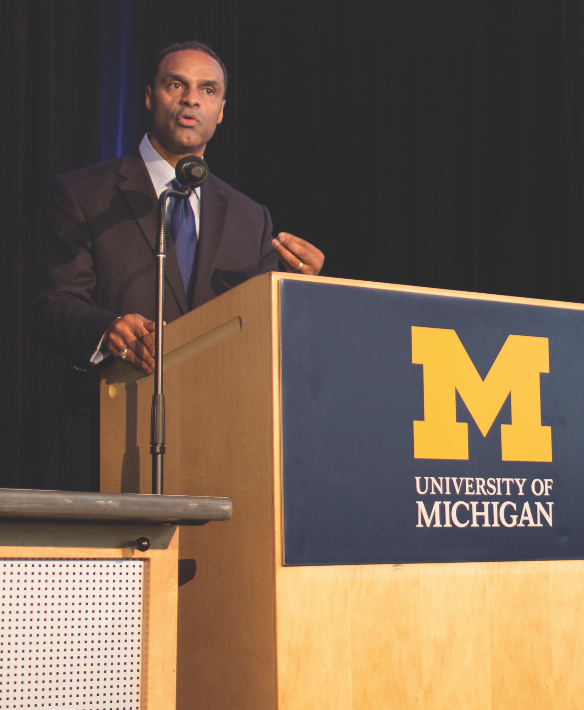 Gallimore current serves as the Robert J. Vlasic Dean of Engineering at the University of Michigan. "We are delighted to have Dr. Gallimore return to SJR from Ann Arbor," said President Donnelly '71. "As our STEAM program grows and students opt for classes in robotics and engineering, having someone of his stature in the field deliver the commencement address is a genuine honor." Gallimore is the third speaker from the Class of 1982, following classmates Karl Kilb (2010) and Michael Mendillo (2013). "It is an honor to have been asked to serve as the 2019 commencement speaker," said Gallimore. "I had a wonderful time at SJR and was well prepared for the rigors that followed–whether that was designing ion thrusters for travel to Mars or leading one of the top engineering colleges in the country. I look forward to sharing my journey and (hopefully) inspiring the newest alumni as they embark on the next phase of their lives." Commencement will take place on Sunday, June 3, capping a weekend of festivities including Senior Awards Banquet and Saturday's Baccalaureate Mass.